Entertaining, challenging and fun with timeless elegance. What more needs to be said about the Winston 14 foot Shuffleboard. 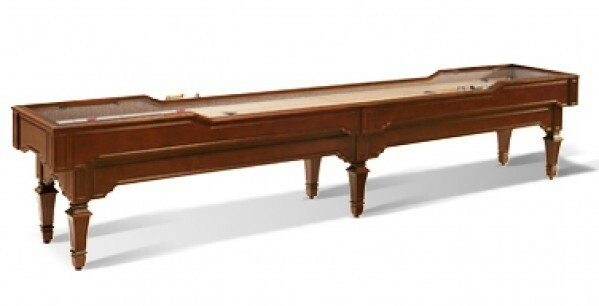 The shuffleboard playing field is 3 inches thick and is made with North American, plantation grown yellow poplar with a .25 inch thick polymer top. The playfield boasts 4 scoring zones for even more action. This Winston blows away the competition in quality and durability and is backed with Legacy's lifetime warranty. For storage of your pucks, brushes, and other accessories, the Winston Shuffleboard table includes Legacy’s patented Perfect Drawer. A glide in storage drawer mounted under the table out of view.